In February 2017, Eastchester Little League and Tuckahoe Youth Association merged softball programs to create "TEB" Softball. 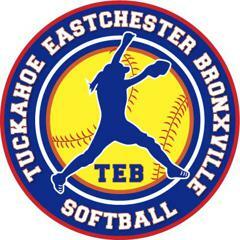 TEB - which stands for Tuckahoe, Eastchester, and Bronxville -- is comprised of over 200 girls playing at the 8U, 10U, and 12U levels who live and/or attend school within the Town of Eastchester and the Villages of Tuckahoe and Bronxville (with no other eligible little leagues within their immediate area). TEB has a full spring schedule, including inter-league games, holiday tournaments, and play-offs. TEB Softball play under the International Little League charter of ELL, allowing our girls a chance to compete annually in the Little League Softball World Series tournament. Additionally, we offer summer and fall travel programs as well as instructional and pitching clinics throughout the winter. Our girls are taught the fundamentals of the sport from the start and are encouraged to reach and play to their potential. They make lasting memories and create life-long and diverse friendships with girls and families who attend the three different school districts and the various parochial schools in our community. Aside from teaching the sport of softball, ELL prides itself on strengthening a girl’s self-esteem, promoting teamwork and sportsmanship, and developing future leaders who are not afraid to fail. For more information about TEB Softball call Robert O’Hare, VP Softball, 917-327-0917 or email robert.ohare@verizon.net.